PICTURE PERFECT ENVIRONMENT! Printed on Rolland Enviro 100 paper! Base pricing includes digital imprint of the same design, in 4 colour process, on all 4 sides. Pantone colour matching not available. 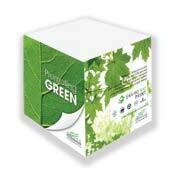 See Paper Cubes - Sheet Imprint & Other Options for sheet imprinting & paper cube options. Product Size : Full Pad: 3-1/2" x 3-1/2" x 3-1/2"
Half Pad: 3-1/2" x 3-1/2" x 1-3/4"
Copy change: $30 each / design. Colour change: $30 each. Printed pre-production sample: $50 per design (50% deductible with order). Number of sheets per cube: approx. 215 / inch. Orders less than minimum quantities: not available. Standard packaging: individual / shrinkwrap. Cubes per box: full cubes - 20 pces; half cubes - 40 pces.